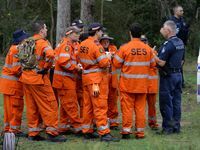 A MASSIVE search operation involving two helicopters, more than 60 police and dozens of SES volunteers resulted in the quick recovery of a two-year-old-girl yesterday, who had gone missing from her Pine Mountain home. Dixie Hornbuckle (pictured) had walked off from the family home wearing only a pair of purple gumboots and a pink ballerina skirt just before lunchtime. 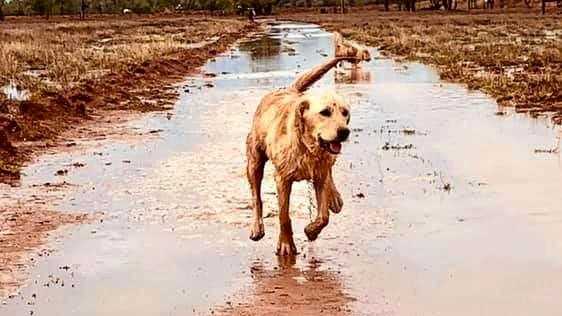 She had taken the family's two pet dogs along with her as she walked into bushland backing onto Kirkston Place at Pine Mountain. There were grave concerns for the welfare of the girl, especially given the fact that she was only scantily dressed. 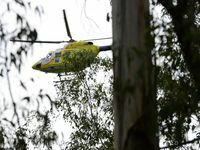 She was spotted around three hours after going missing by crew members from the RACQ CareFlight chopper. They saw her hiding under lantana - her two pet dogs keeping her company - about 800m from home. Apart from a few scratches, she was returned to her family safe and well. Her uncle Brendan Allan said she was fine but had been frightened of the helicopters. Missing girl returns home: The moment the missing two-year-old from Pine Mountain returned home. Search for missing two-year-old: Search for missing two-year-old. Air and ground search for a missing child: Police are coordinating a large-scale air and ground search for a missing two-year-old.